Feng Shui Tips for Christmas. How to Boost your Feng Shui at Christmas Time. Where To Place Your Christmas Tree For Wealth & Health Using Feng Shui Bagua. Christmas is a great time to boost the feng shui of your home and office/business. Rituals are panculural. Since light is one of the top feng shui remedies you can use it strategically to enhance different zones of the feng shui bagua (relationships, career, family, wealth, health, helpful friends/travel, projects/children, wisdom and knowledge, and success/recognition). Or better still use the Xmas tree to boost specific parts of the bagua. 1. 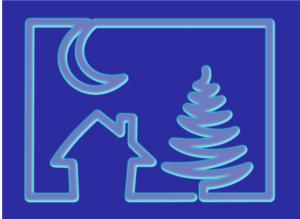 Energise the bagua of your home with your Christmas tree. Where to place your Xmas tree on the feng shui bagua. Choose the part of the bagua that you want to energise and place the Christmas tree there. If you want to energise different parts of the bagua place other Christmas decorations such as poinsettia plants. 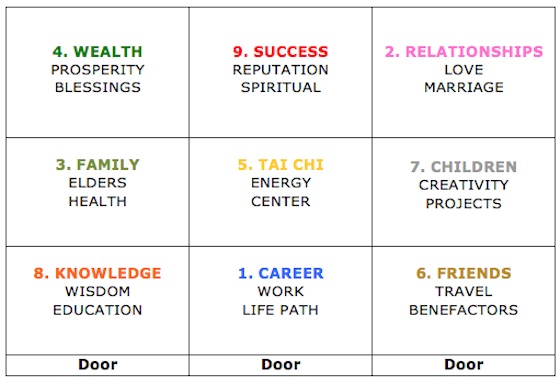 You can use the door bagua or compass bagua, depending what works best for your home and workplace. Obviously, natural Christmas trees are better since they’re alive as opposed to plastic ones (which can create an environmental problem and are difficult to recycle). To use the bagua, place it over a plan of your home/room in such a way that the door to your flat/home/room is at the bottom of the page in the areas of knowledge, career and helpful friends. This energetic pattern can be used on other things such as your business card, your desk, website, car, etc. 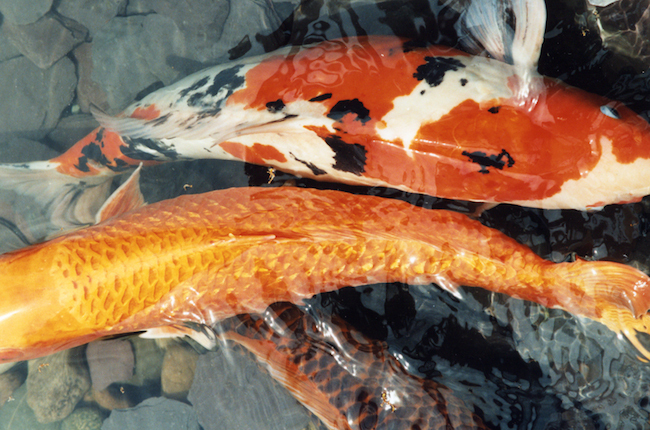 In many parts of the world traditionally carp is eaten on Christmas eve (in Japan koi carp is also eaten). Get some scales of the Christmas carp and place them in your wallet for a greater prosperity in the coming year. Short of that, you can place a small photo of the koi carp in your wallet or/and just use the image as a wallpaper for your mobile or computer screen. Your mobile phone provides a perfect virtual environment for your feng shui remedies and adjustments. Read more about some fundamental feng shui tips for life and business. Christmas is a very family-oriented event. Print some photos of the whole family and place them all over your home. Research suggests that having pictures of the family around boosts our resilience and self-esteem (because family members can be a resource). This is especially important for children and teenagers, they need to see themselves as a part of a family. Space clearing which is always recommended in feng shui is also found in many cultures all over the world as a way of changing the energies of environments as well as improving the overall vibration of the place. The end of the year is coming near so you can let go of some things, to create new room for new beginnings, new opportunities and new energies. Letting go of mental and emotional stuff is the most difficult though – watch this video clip on the power of letting go. Naturally, the whole Christmas event will have a clearing effect on your home. If you have a natural Xmas tree that will change the energy of your home. If you prefer the artificial Christmas tree then use some candles or a feng shui space clearing mist. Traditionally, people would fast before Christmas, which has many benefits (apart from the health benefits, fasting is good for prosperity because it sharpens your mind for resources). Read more about the benefits of fasting. Feng shui was originally invented for the design of and auspicious location for burial places to ensure the happiness of the ancestors. Later, oriental people discovered that feng shui can be used for homes, workplaces and business. A few moments remembering and honouring your parents, grandparents and all ancestors will create a positive energy around your past. After all, they gave us our life. 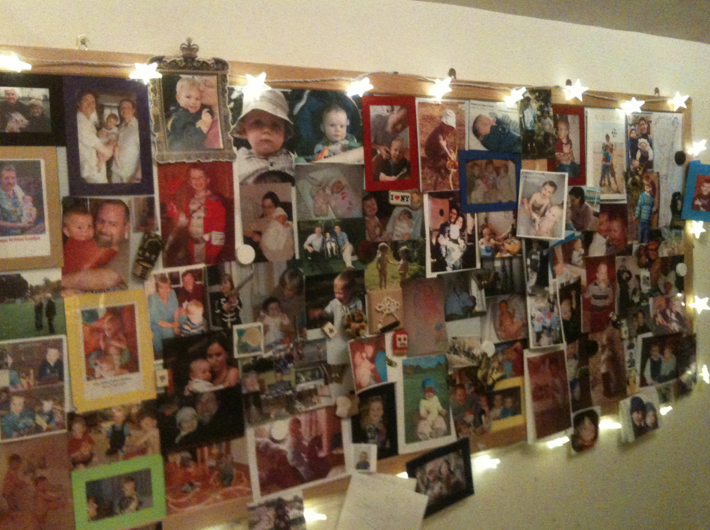 Light some candles on their graves or just by their photos (see the feng shui tip number 3 about the family photos). If possible you can energise the family aspect on the bagua of your home or living room (see the feng shui tip number 1). It’s no surprise that the family area of your home is also representative of your health (genetically, environmentally, emotionally, etc). All above feng shui tips for Christmas can be adopted and modified for boosting your business. 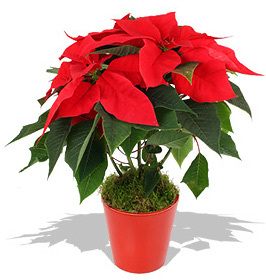 Just having a few poinsettia plants will enhance the feel of your office. Any little Xmas accents or symbols can be used on your desk where you work. Posted in Bagua, Chi, Feng shui fish, Feng shui remedies, Feng shui tips, Feng shui tips for Christmas and tagged Chi, Poinsettia plants in feng shui.